For a tire centre in Ottawa like no other, visit Surgenor Chevrolet Buick GMC Cadillac. Canada, as we all know, experiences all four seasons, so it’s important that your vehicle has the right tires when you head out on the road. Whether you need winter or summer tires, you can find it all at Surgenor Chevrolet Buick GMC Cadillac in Ottawa. Not only can you buy tires for all seasons, we can even install them for you on-site. We also provide the expertise necessary to make the right decision when it comes to the proper tires for your GM vehicle. Not only does the tire centre at Surgenor Chevrolet Buick GMC Cadillac help you find the ideal tires and install them on-site for you, we can also store them for you during the off-season. Visit the tire centre at Surgenor Chevrolet Buick GMC Cadillac in Ottawa and browse through our vast collection of winter, summer, or all-season tires. Surgenor Chevrolet Buick GMC Cadillac is proud to be the home of one of the cheapest tire storage services in the Ottawa-Gatineau area. As many apartments and houses in Ottawa or Gatineau don't have room to easily store summer or winter tires, our GM certified service team decided to craft an affordable and convenient tire storage solution. Brakes: ACDelco ® DuraStop and ACDelco Advantage. Tires: BFGoodrich, BRIDGESTONE, CONTINENTAL, DUNLOP, FIRESTONE, GENERAL, GOODYEAR, HANKOOK, KELLY, MICHELIN, PIRELLI, and UNIROYAL. The competitive price you find must be in a valid ad, written estimate, or Internet quote for identical new tires OR for select Raybestos Professional, Wagner ThermoQuiet, Bendix, Satisfied Brakes, Raybestos Service Grade, Monroe/Certified, CarQuest Red, NAPA TruStop, Midas, Fountain Tire, KalTire, Centric, Wagner QuickStop aftermarket brake pads, shoes, rotors or drums. The tires must be an exact match in brand, tire line, size, load rating and speed rating to be eligible for the price match guarantee. Internet quotes are eligible from local tire and/or brake retailers only within an 80 km radius of your dealership's location. The competitive price must come from a local competing tire and/or brake retailer and installer (with a physical location within 80 km of your participating Chevrolet Buick GMC Cadillac dealer). The competitive price must be valid within 30 days of your purchase of any of the tire and/or brake brands listed above. 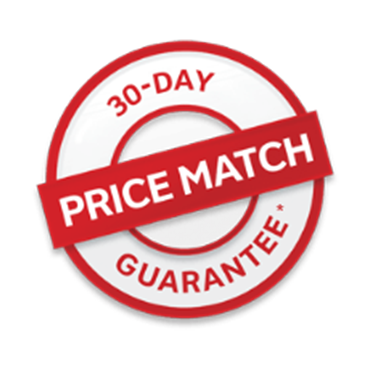 The price match guarantee is only valid on the brake and/or tire price and does not include installation. *Buy the following aftermarket brake brands: ACDelco DuraStop or ACDelco Advantage AND/OR the following tire brands: BFGoodrich, BRIDGESTONE, CONTINENTAL, DUNLOP, FIRESTONE, GENERAL, GOODYEAR, HANKOOK, KELLY, MICHELIN, PIRELLI, UNIROYAL and if you find a better price on similar aftermarket brake brands within 30 days of the purchase, we'll refund the difference. Requires valid ad, written estimate or internet quote for identical new tire(s) AND/OR for select (Raybestos Professional, Wagner ThermoQuiet, Bendix, Satisfied Brakes, Raybestos Service Grade, Monroe/Certified, CarQuest Red, NAPA TruStop, Midas, Fountain Tire, KalTire, Centric, Wagner QuickStop) aftermarket brake pads, shoes, rotors or drums from a local competing retailer and installer located within 80 km of the dealer required during offer period for price match. Offer available to retail customers only at participating Canadian Chevrolet Buick GMC Cadillac dealers. Offer valid on tire and/or brake part (pads/shoes/rotors/drums) price only; cost of installation/labour not included in price guarantee from January 1, 2017 to December 31, 2017. GM Canada reserves the right to cancel, modify or amend the offer without notice. Conditions and limitations apply. May not be combined with other offers and programs. For details, visit mycertifiedservice.ca.